Total of 12. Benjamin did 10. We are upping his mileage a little bit to help him improve his endurance. Of course, there is only so much we can do - it is inevitable that his endurance will lag for a while as he goes through puberty, but I think we can mitigate the fallout a little. After watching him for some time I decided that middle distance intervals right now are counter-productive for him. He has plenty of speed, and it is tempting for him to use it, but when he does it overworks his heart and generates a whole slew of substances that are counter-productive to healthy aerobic development. So I told him no middle-distance stuff until his half is at least sub-1:10. Another indicator is that 7:30 pace should not run him out of breath like it does right now - I suspect the inability to run sub-1:10 half and all this huffing and puffing at 7:30 pace are connected. Jenny and Julia had minor colds and cut down their runs to avoid making it worse. Other kids ran their usual distances. With Joseph, Jacob, and Benjamin. With Benjamin. He said he was feeling some kind of odd fatigue, so half way through the run I made him slow down to make sure the run would be beneficial. He wanted to run one mile less at a faster pace, I told him to listen to his dad, sometimes teenagers need this reminder. Total of 12. Today the kids ran in the Kiwani's park cross-country 2 K. Benjamin did not run because he had a class during that time. Everybody else except Matthew who is too little ran. I was not going to have Stephen run because the distance was too long for him, but he caught on to the excitement and wanted to, so he started, but made it only to about 600 meters and then saw Sarah and just went off the course to her. He should have better luck in the 1 K.
Joseph took 5th overall and 2nd in the 9-10 division with 8:03, Jacob was 10th overall and 1st in the 7-8 division with 8:24. Julia and Jenny struggled with their colds but still ran decent - Julia 9:10, first in the 11-12 division, Jenny 9:41, 3rd in the 13-14 division. William won the 6 and under division with 10:19. Benjamin ran 9 miles with me in the morning. Total 12. Benjamin had a sore throat, so he ran only 7 just in case. Jenny and Julia were recovering from their colds and ran less as well. Other children ran their usual distances. With Joseph, Jacob, Benjamin, and Jared. First mile alone, the rest with Tommy Gruenewald. Unlike many collegiate and post-collegiate runners he knows how to keep the easy runs easy. Total of 12.5. Joseph and Jacob did 3, Julia and Jenny 2, William 1, Stephen 0.5. We had a visitor today. His name is Greg. He is getting back into shape. So Joseph, Jacob, Jared and Benjamin ran ahead, and I stayed back with Greg. Tempo run out and back from the house on the usually hilly course. Total of 12. Benjamin did 5 due to a cold and fatigue resulting from it. Other kids ran their usual distances. We discovered that Jenny has anemia - 8.4 ng/ml ferritin (normal range 13-300), and 20 ug/ml iron (normal range 24-154). That explains her struggles with endurance lately. She started taking an iron supplement. Total of 20. Did 5 miles of tempo running. Joseph and Jacob did 3, Benjamin 7, Jenny 3, Julia 3.5, William 1, Stephen 0.5. To the start of the tempo. Did a pickup and caught to a highschool runner named Clint. Ran with him for a little less than 2 miles. Pick-up to catch Clint (up the canyon). Tempo run back to the house. The last 2 miles were difficult due to the fatigue and the terrain, but managed 11:56. Day of rest. Went to church. No baby yet. Total of 12. Benjamin did 7. Everybody else ran their usual distances. Total of 12. Benjamin did 9. Joseph, Jacob, Jenny, Julia and William ran in the Kiwani's Park Cross-Country race. They did only a short warm-up in the morning. The distance was 3 K and I think it was accurate this time. Joseph ran 13:03, Jacob 13:18, Julia 14:26, William 15:41, Jenny 15:54. Jenny struggled due to low-iron issues. Julia also struggled with something - she said she was feeling weak all day. Everybody except Jenny, though, won their divisions. I was particularly impressed with Jacob's and William's performances. Total of 12. Kids ran their usual distances, except for Jenny and Julia - they ran only 2 - the race took some wind out of them. With Benjamin, Joseph, Jacob, and Jared. Total of 13.5. Kids ran their usual distances with the exception of Jenny and Julia who ran only 2. With Joseph, Jacob, and Jared. Total of 12. Kids ran their usual distances. With Benjamin. We got talking about his C++/algorithms class and got too lazy on the pace. Today was an eventful day. Mary Rose Pachev was born at 9:16 pm at our house. She joins her two sisters and six brothers. Sarah went into labor last night. We were on the way to the temple with Benjamin. Our plan was to go together all three of us, but her contractions were strong so we just dropped off Benjamin there, told him to find a ride home, and went back. However, when our midwife came the contractions have stopped, so we sent her home. The contractions started again in the middle of the night. The midwife came back at 5 am, but shortly after that the labor began to stall. Sarah was dilated to 8. We figured if she went for a run, it might get things started again. So Sarah and I ran one mile together. This was her longest run so far while in labor - she has run at this stage of labor before, but it was only 100 meters or so. This, however, did not get the labor started. We waited a while, sent the midwife home, then more or less went about our day, except I ran only 8 more miles, 9 total because I did not want to be too far away from home. I did do a short 2 mile tempo run, though. Finally later in the evening the real labor resumed and it was going fast, we had a bit of a scare and a long 14 minutes with Sarah's water breaking before the midwife got here, and about an hour later Mary was born. Her umbilical cord was short, which slowed down the labor. Some more distance. The kids ran on their own today. Day of rest - sort of. Took the kids to the Stake Conference. Benjamin and Jenny took turns staying with Sarah and Mary. Sarah cannot be left alone the first few days after a labor because of the tendency to bleed. Took a long nap in the afternoon. Total of 12. Benjamin did 9, Joseph and Jacob 3, William 1, Stephen 0.5. Jenny 4, Julia 3 - I think. Alone. Legs moved, good sign. Total of 12. Needed to answer the question if I should run the Top of Utah marathon. There were two issues - how Sarah is recovering, and what kind of race to expect. Decided to test the legs with a 2 mile tempo with Benjamin. The target was 5:50, but of course he pulled me through it at 5:29 average with a couple of surges that took us into 5:10 range. I handled them fine, so I figured physically I'll be good at least for the first half, and then we'll see. Joseph, Jacob, William, Stephen, and Jenny ran in the Kiwani's Park "1K". In quotes because based on their times it was around 900 meters. Joseph got 3:15, Jacob 3:36, Jenny 3:50, William 4:05, Stephen 5:29. Joseph, Jacob, and William won their divisions, Jenny was 5th. Tempo run with Benjamin. The target was 5:50 pace, but he kept surging, I decided to not restrain him too much because I felt good and wanted to know how I would respond to them. With Benjamin to the house. A little bit more distance alone to finish the 12. Total of 10 - mini-taper. Kids ran their usual distances. With Benjamin, Jared, Joseph, and Jacob. 7 total. Kids ran their usual distances. Total of 6. Did a mile pickup in 5:38.8. Kids ran their usual distances. Alone - did a pickup for a mile. Executive summary: 2:39:03, 8th overall, 1st master, $500, broke my own master's course record from last year. This was a miracle run - with Mary's birth I was not sure I was going to run at all, but on Tuesday Sarah and I talked about it and she said she was recovering well and could handle the household with the help of the kids, so I made the arrangements. I was not expecting much, just hoped to finish at all and maybe a little better than embarassing, but after a little tempo run on Tuesday with Benjamin I knew that at least the first half would give me more than that, and just hoped not to completely blow up in the second. I ended up doing 1:15:35/1:23:28, last 10 K in 41:01, more positive that usual, through the first half I felt good enough that if you had asked me what I was headed for with normal endurance I would have said 2:35, but I knew I would have to pay for my lack of 10 mile tempos at the end of 20 in the second half. At that point I just hoped to do a little better than my last year's time, but ended up doing more that a little better. Now the full report for the race. I stayed with Steve Anderson. Set my alarm incorrectly, but fortunately woke up in time to make it to the bus. The race. It was my 16th time on this course. 16 out of 16 - I do not know if there were any other runners that have run all of them. 6 years ago they had a special 10 year club ceremony, and I recall maybe only 5-10 people. At the start saw a few familiar faces, and met a few new friends. One of them was Bryce Carr. I had actually met him before briefly. We ended up running together for a good portion of the race and spoke mostly Russian. Tylor Thatcher won with 2:21:54, then Jason Holt 2:26:59, Jake Krong 2:28:14, Jon Heslop 2:31:42, Daniel Bishop 2:33:26, Nate Hornok 2:36:41, then Bryce and myself. Poor Nate - he was in the 5th place for most of the race, but ended up being the ram in the thicket to be sacrificed by Daniel. For consolation he got $50. I must admit I started having ambitions to perform the sacrifice myself but lacked the strength, plus I would have had to hold off Daniel which would have required a higher level of fitness. It felt easier than expected. A pack formed with Bryce, Nate Hornok, Jon Heslop, Steve Anderson, and Mike Stutz. Still in a pack, this mile felt good. I am starting to count my blessing. The pace is faster than I was planned and it does not hurt yet. This is starting to hurt, but I am not willing to lose contact with the pack. When in doubt, I prefer the optimistic approach hoping that either the pack will slow down, or that I will find a way to relax and find the rhythm. One more aggressive mile with the pack. Steve Anderson backed off somewhere around here. Bryce and I also decided to back off and run more conservatively. With Bryce - saw a moose. Working with Bryce to catch up to Mike. We caught up to Mike. I explained to Bryce what we were going to do next with the help of a joke in Russian. Khruschev, a Soviet leader of the 60s, used to say: "Let's catch up to, and pass America!" A response to that is that it is OK to catch up to, but we'd better not pass because America will see our exposed rear end. The Soviet Union was the first to send a man to the outer space, but this was a show-off, the economy overall had a lot of embarrassing gaps and severely lagged behind. So in the spirit of that, we just tucked behind Mike and followed him for a while. Sticking with the plan of not passing America for the reasons mentioned in mile 9 note. A lull in the pace. I think this is where all of us had some kind of an aid station mishap and lost some time. Magic wind carries us, but we are using it to conserve energy. All in all I think the plan of catching up to and not passing "America" was good - Mike pulled us at a good pace up to here. The pace is still good. Around here Bryce decided it was time to follow Khruschev's original plan, pass "America", and take off. I did not quite feel ready for it and stayed with Mike. With the pace dropping to slower than 6:00 I considered passing Mike but decided against it. I knew that I needed to save the energy - with my endurance not being where it aught to I needed to be careful. Mike is starting to lose it. I am not feeling super great, but I think better than him. Uphill mile. I passed Mike and started working my way to catch up to Bryce. Another uphill mile. This was a cause for concern, but at the same time a reason for optimism. Concern because I could not increase the pace. Optimism because it was still respectable and statistically I have in the past averaged around whatever I do in this mile for the rest of the race. And if I could do it, I knew I would be getting the master's course record. If I did not get passed by another master, that is, which is always a threat. Somewhere around here Daniel Bishop flew by me as if I were standing still. He ended up running 2:33:26 with the last 10 K in a little over 35:00. This was a very remarkable performance for him, his previous PR was 2:42. I could not even dream of latching on. The last downhill mile, last chance at a swan song, so to speak. 6:18 was all I had, but at least it was something that was closer to 6:00 than it was to 7:00. Now I just need to survive the next two miles. I consider miles 22 and 23 the darkest miles of this course. At this point you know you have no more steady downhill, you are tired enough, the finish is still far away, and you are roaming through neighborhoods with no clear goal in sight. Year after year this has always been the place that gave me the highest amount of negative thoughts. So I told myself - just make it through those miles without bleeding too much time, or just make it somehow. One more dark mile - closing the gap on Bryce. This mile has always been a mile of relief. Only two miles left, it has a short downhill dip that helps you get going, so you usually end up with a faster split. You begin to believe that you can actually get to the finish in some respectable time. This year was no exception. I passed Bryce around here. Even though this mile is uphill, it has a lot of crowd support. You do not feel alone anymore. You know the finish is near. Bryce passed me back - this was unexpected. Usually if you pass somebody this late in the race, and he cannot find another gear to go with you, he is done. But Bryce was an exception. I do not think I ever witnessed such a comeback in 60 marathons. This mile was a little long. I estimate it at 1.05. I think I will e-mail the race directors next year and remind them to make sure mile 26 is in the right place. This could be worth as much as 5 seconds for the overall time in this case. The reason is that the correct location of this mile would make the mile marker visible from about 200 meters, so seeing the mile marker cheers on the runner and gives him a goal to chase. Then seeing a faster split for mile 26 infuses hope for a good finish time, and stimulates the kick. During this mile I passed Bryce again. It is noteworthy that both times I passed him on a downhill. I wonder if his quads were so trashed he could run downhill anymore. Kick. Given the time it was obviously shorter than 385 yards. But if you adjust for the long mile 26, this works out perfectly. I tried as hard as I could to make Bryce not want to catch me, but did not succeed. He kicked and passed me right before the finish line finishing half a second ahead. Day of rest. We attended the Ogden Temple Rededication Broadcast today. Recovery 9 miles. Perhaps it was too long, but I kept the pace slow to make up. Kids ran their usual distances except Joseph. He had injured his foot and could barely run 0.5 with Stephen. Recovery 8 miles. Jenny ran 4 in the morning, Jacob did 1, Stephen did 0.5, everybody else rested for the 4K cross-country race. We were not sure if Joseph would be able to run, in fact this appeared unlikely. He was limping throuh the house. I asked him if he wanted a blessing and he agreed he needed it. In the blessing I felt an nudge from the Spirit to bless him that he would be able to race in the evening. I was reluctant to respond to it, but I did. This was a lesson in faith for me. When the time came to go to the race Joseph reported that his foot felt good enough to run on it and he would like to race. He did and won his age division running 18:49. He said the foot did not bother him at all during the race. Jacob won his age division as well with 19:07, Julia was second in hers with 20:04, and William won his with 22:01. I was particularly impressed with William's run. He is not yet 6, and his longest run prior to this was 2 miles. Yet he not only got through the distance but he ran it competitively and won his age division by 6 minutes. Jenny stayed at home and helped Sarah with Mary and Matthew. 3 with Joseph, Jacob, and Benjamin, with extra 0.5 while they were going to the bathroom. Total of 13. Did a tempo run with Benjamin that was a little over 3 miles. Tempo run down the canyon. Benjamin gapped me by 7 seconds over the last quarter. We kept the pace steady more or less. Was short on time today, plus did not get enough sleep due to Matthew's teething, so only 10. Kids ran their usual distances. 12.6 total. Did a tempo run with Benjamin - 3 miles down the canyon in 16:21. Kids ran their usual distances. With Benjamin, Joseph and Jacob. Tempo run. Mile splits were 5:28, 5:26, 5:27, but the pace was not even. We started out a bit slower then made up, then towards the end Benjamin sped up to 5:20, and dropped me with 500 to go. I was spent and all I had was an 84 quarter. However, he cranked it up, hit 70 in the last quarter and finished in 16:04. 12 total. Usual distances for the kids. 800 with Stephen on the track. 1600 with William on the track. Total of a little over 12. Did a tempo run with Benjamin. Kids raced cross country - all except Jenny, she stayed with Sarah. Jenny and Julia made the agreement that Julia will get to race since she has a chance at winning the series in her age division. The race was 3 K. Joseph ran 12:39, Jacob 13:09, Julia 14:02, and William 16:36. The course may have been shorter than last time. Everybody won their age division except Joseph who was second. His performance was good, but his competitor James Harrison who beat him in the 2 K earlier ran better - 12:22. William for some reason ran slower today compared to his last two races. 3 mile tempo down the canyon with Benjamin. Neither one of us was feeling that great. We even slipped and ran a 90 second quarter from 0.25 to 0.5. Then Benjamin gave it a good push and that did me in. The first mile was 5:33, then we did 5:23, and with 1200 to go I was spent and all I had for the last mile was 5:45. 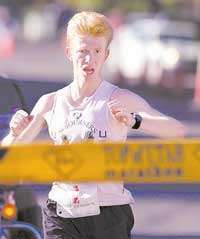 Benjamin held a more or less steady 5:20 and finished in 16:14, but did not feel like going any faster. My problem was the lack of sleep and I was feeling the heart skipping beats, so I took a nap later in the afternoon. With Jenny. This was hard for her - anemia has sapped her endurance. But she has strong muscles and good short speed, so she ran the last quarter in 96 and got a decent time.